Do you already have a degree in business or economics? And now you would like to receive further qualification at a prestigious university with excellent study conditions? Then set your course for HHL and start out on your path to executive and management positions with our 18-24 months management course held in English. 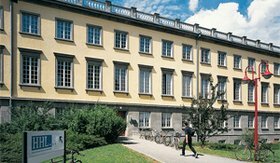 HHL is not only Germany´s oldest business school, but it also remains one of the leading managament institutions. In addition to its international focus, the synthesis of theory and practice at HHL is central. HHL’s Master of Science Program and its innovative MBA Program are designed to prepare effective and responsible business leaders for the challenges of the 21st century. HHL is not only Germany's oldest business school, but it also remains one of the country's leading managament institutions. In addition to its international focus, the synthesis of theory and practice at HHL is central. Furthermore, HHL has set itself the goal to educate effective and responsible business leaders through its “Integrated Management” approach. HHL offers an 21 - 24-month Master’s program in Management leading to the degree Master of Science (M.Sc.) as well as a 24-month part-time Master in Management program. In addition, HHL has an 18-month full-time (24-month part-time) MBA program for professionals. A Global Executive MBA Program as well as a three-year doctoral program, which can also be completed by professionals with the appropriate qualifications, tops off HHL’s portfolio of degree programs. In April 2004 HHL received the highly-respected accreditation by AACSB International. The maintenance of accreditation for a further five years was granted in April 2009. Leading consulting company Roland Berger Strategy Consultants has praised Leipzig as the most innovative city in Germany. Building on its century-old history as a center of trade and commerce, it has attracted global players like BMW, Porsche, DHL, and Amazon.The cultural variety in this city is immense. Opera, theaters, famous music venues, historic halls, cabaret, musicals, small clubs, festivals, art galeries, and ateliers of every kind give you many possibilities to explore the wide-ranged cultural life. Besides this, the city is famous for its zoo and surrounding lakes. It takes you just 30 minutes to get to the most popular lake, Cospuden, where you can also windsurf and sail. Leipzig’s nightlife is a melting pot of all kinds of bars, cafés, and restaurants that meets everyone’s taste. Just sitting at a bar and enjoying a freshmade cocktail, or having a romantic Venetian-style boatride with a candle light dinner on the beautiful canals of Leipzig – everything is possible. Simply put: Leipzig is a fantastic city just waiting to be explored. International competence is essential for a business leader. Global partnerships are therefore one of HHL’s key assets. We serve selective number of students with over 110 partner universities around the globe. For the complete list, please got to hhl.de/discover-hhl/international-relations/partner-universities/ Within the double degree option, it is also possible to earn an additional degree at selected partner universities (e.g. International University of Florida, INCAE - Costa Rica, Växjö University - Sweden, KDI School of International Policy and Management - South Korea). Within the double degree option, it is also possible to earn an additional degree at selected partner universities (e.g. International University of Florida, INCAE - Costa Rica, Växjö University - Sweden, KDI School of International Policy and Management - South Korea). HHL is recognized by multinational recruiters and companies as a source of individuals and future leaders with proven academic excellence and strong leadership potential. Our Career Service will actively assist you in a successful job search with a well-designed mix of activities. The key element of our Career Service is the effective personal development strategy module. Our team will work with you on selfassessment, career path modeling, mentoring and coaching in order to help you identify your personal priorities and your future career path. Providing access to research databases on assessment center minutes, company profiles and salaries. At HHL we offer more than a degree from one of the best business schools in Europe. We work hard to foster a strong network of contacts and sustainable friendships. Your personal experiences with classmates and professors will last a lifetime and serve your professional lives. Beyond the campus there is a “worldwide web” of dedicated and helpful alumni and sponsors. Once you have completed your studies at HHL, our Alumni Association becomes your second family. Our alumni are HHL’s ambassadors representing dozens of countries and a variety of high-value industries. They hold executive managerial positions at leading companies, e.g. Puma, Tom Tailor, Google, Infineon, McKinsey&Company, Goldman Sachs, Procter&Gamble, Bayer, BCG, Bosch, Merck, RWE. HHL counts among its alumni some of the most dynamic young German entrepreneurs, who have founded more than 120 companies and created over 2500 jobs in the past 10 years. 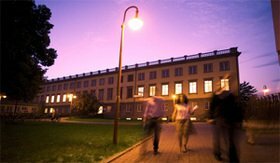 Apply for a Master of Science or a MBA-Program at one of the leading management institutions in Germany. HHL's M.Sc. program contains a broad spectrum of management-related topics that will enable you to develop solution strategies for a variety of problems that may arise in different fields of business. You will find that our practice-oriented academic education is ideally suited to the challenges faced by global businesses. Furthermore, we are strongly focused on the individual needs of our students. Our graduates confirm the success of our concept with their achievements. 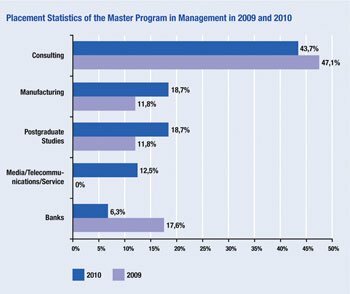 The curriculum of the MBA program is structured into the following major parts: Core Modules, Elective Modules and a Master thesis. The full-time MBA program is designed as an up to 18 months program; this corresponds to six terms. Core- and elective modules are offered during term one to four. During the fifth term you have the option to do an internship or exchange term, while the sixth term focuses entirely on your master thesis. The curriculum of the part-time MBA program is structured into four major parts: Core Modules, Elective Modules, the Global Immersion Seminar and your Master Thesis. The two-year program comprises 90 ECTS credit points in total. Supplementary to your MBA courses, company visits will lead you during your stay at HHL to different places in Germany discovering interesting business models, current management procedures and networking opportunities. The Global Executive MBA program is a joint program with EADA Business School in Barcelona. Courses take place during 10 residential weeks at HHL, EADA as well as at top ranked partner universities in Brazil, China and India. The program starts in October and takes 18 month. We cater to your personal time constraints by offering various program designs. Whether you want to finish your studies in a very short space of time – or choose to complete additional internships – decide for yourself and select the model that works best for your individual career planning. Our part-time programs are suited for students who work full-time. Classes take place on weekends over the course of 24 months. In order to keep abreast with current international, social and economic challenges, our students will spend one term abroad. The learning experience focuses on the methods of working and the way of life in foreign cultures. The courses taken abroad will be part of the student’s performance record and are given equal value considering the overall grades at HHL. Within the double degree option it is also possible to earn an additional degree at selected partner universities. The variety of our students will give you an understanding of your future workplace: the globe. Especially in the MBA program students will come from all over of the world, having earned academic degrees and gained practical experience in diverse fields such as business, architecture, communications, education, engineering, geography, history, IT, law, linguistics, medicine, music or psychology. Several admission test dates are offered at HHL throughout the year: hhl.de/master-of-science/application/ The application deadline for the part-time M.Sc. is September 15 for students requiring the pre-module and January 15 for students with 210 ECTS or more in their first degree. HHL’s Admission Committee will determine admission on the same day of the admission tests taking place at HHL. The Admission Committee consist of elected members (two professors, one academic assistant, one administrative staff member, one student) and the examinars of the test day. After the interview the final decision is made within two weeks. If you are admitted we offer you a contract and we provide you with a mentor out of current students who helps you to guide you through HHL. We operate on a rolling admission process. The Admission Committee evaluates and responds to an application within one month of receipt. We encourage those interested in the program to apply as early as possible. For the part-time MBA class starting in March, the applications should arrive no later than January 15. Sparkasse Leipzig is the official financial cooperation partner for HHL students and offers a student loan without presenting additional securities. Further low-cost student loans are available from various banks or the cost of the tuition fees will be covered by an education fund.